In the modern world we are surrounded by sugar, making it almost impossible to consider giving it up. The white stuff is everywhere, in savoury food in supermarkets, yummy cocktails at the bar, and even in ‘healthy’ snacks in ‘wholesome’ shops where it is sneakily labelled (hidden) as ‘agave’ or ‘honey’. The problem is down to our food supply chain, yes, but that is directly linked to demand – we naturally love the stuff! The problem is sugar does not love us back, the more we eat the worse the effects are likely to be and the more we use it as a vice. This is not a diet, eat regularly! Just make sure you NEVER snack on sugar, it won’t fill you and you will want more. Eat decent meals with a few snacks, and your blood sugar levels will keep you from craving the sweet stuff. Drinking sugar is for dummies. Thankfully alcohol is safe – huzzah!! Wine, beer and spirits are very low fructose, so we are not dummies for drinking that (just be careful of those mixers!). Stay away from soft drinks and fruit juice, the sugar is a direct liquid hit to the body = crazy rapid fat stores. To start with (sadly) don’t do any of my fructose–free baking. You need to train your taste buds away from sweetness, and also your mind. When I first started I did 8 weeks cold turkey, which I know is a long time but helps you change your approach to food and things start tasting better. I would recommend at least 2 weeks without any sweet tasting food, then bake away! Read those labels. They are there for a reason. Ideally you are looking for under 6g sugar per 100g (this is under ‘Carbohydrates’, ‘of which sugars’…). Also beware of devious marketing people, the ‘healthy’ food advertised as having ‘naturally occurring sugars’ really means ‘super high in fructose’. Also be weary of Low GI foods, often these are full of fructose as the sugar is invisible to our pancreas, hence the lack of insulin response. Be careful at Brekkie. This is the hardest meal without sugar. Cereal is a particularly sneaky one, even the ‘healthy’ wholegrain products contain oodles of sugar, and don’t even go there with granola… Also don’t be fooled by honey in your porridge – its just as bad as the white stuff. Some good options are wholemeal toast, nut butters, eggs, bacon, and porridge with berries. Fill up on the good foods and always go wholegrain. Just ‘crowd’ out the sweet stuff, and try and get as much goodness in as possible. 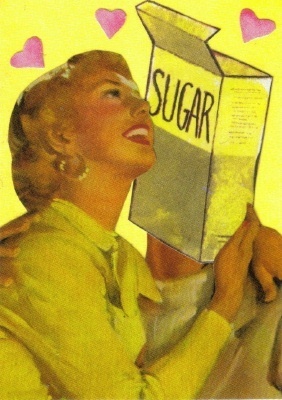 And when food is nearest its whole form the less processed sugar it will contain. The caveat to this is fruit, of course have some, but I tend to limit to 2 pieces a day… you really don’t need more. Be realistic. Heck if someone has bought in cake to work, and its home made, and its chocolate, and its Monday morning, and… well sometimes its okay to give a little. Don’t be a complete bore, just know your limits and think of the bigger picture. Plus when you do slip or have the occasional treat, don’t beat yourself up, just dust off those shoulders and get back on the bandwagon! Treat yourself in other ways. Go for a walk with a friend, grab a latte, do your favourite gym class, buy yourself a magazine, just sit and breath. Food does not have to be your only reward, and it is best to move away from this kind of thinking. Hey, loving these tips and your whole blog as well. I’m about a month in to my journey and finding every day gets a bit easier and I’m less and less interested in sweet things. My skin is especially happy that I’ve made this change, so much clearer and brighter. It’s also really nice to hear tips from a fellow Londoner, so many of the sugar free blogs seem to be Australian or American. Keep up the good work! Hey Nicci – thanks so much for the support!! It really is great to hear, and so appreciated. You will definitely find that as you get further along ‘the journey’ you do get disinterested in the sweet stuff. Plus I completely agree re. clearer and brighter skin, I had problems with breakouts all the time pre-quitting sugar – now my skin looks so much more radiant. As and FYI, I will be posting about skin-boosting juices and smoothies in the next fortnight so keep your eyes peeled for that one! Glad you enjoy the UK perspective too (no ‘cup’ measurements!!). I had the same problem when first starting out, which is why I decided to start a blog for us fellow brits on the quitting sugar journey. Please do let me know if there is anything you would like to see on here/have any questions! p.s. your blog is fab too!